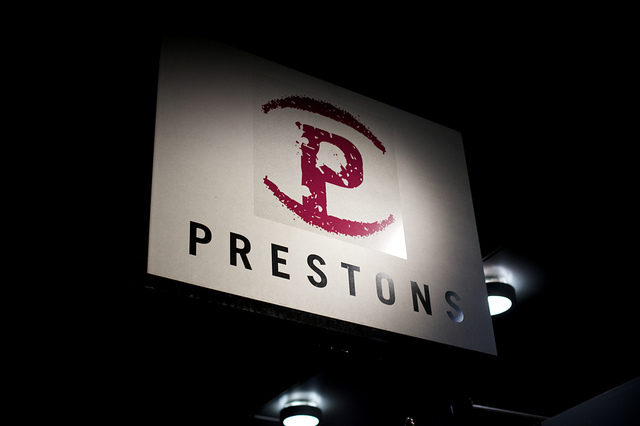 Earlier this week, I swung by Prestons on West Pender for a closed media event to celebrate the newly launched Canadian inspired menu by Chef Bruce Nollert. The new menu is focused around a modern approach to classic comfort food using locally inspired ingredients. 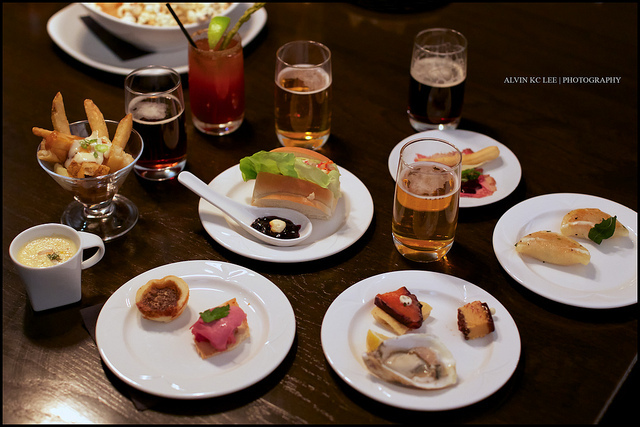 The event was co-led by Molson Coors which meant a variety of great beer pairings to go with the food. What made this media event unique was the way the entire venue was broken up into four different areas representing major parts of Canada. 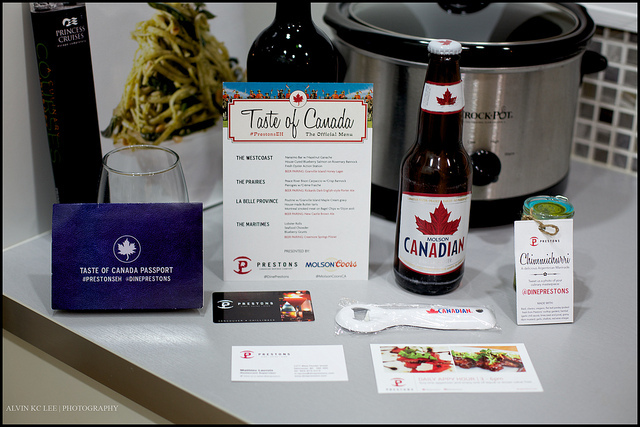 Each attendee was given a navy blue ‘Taste of Canada Passport’ which they would bring to each station for a stamp. Invitees were also given drink tickets but the host staff were so generous that honestly we were allowed to drink as much as we wanted. As a Vancouverite, I felt obligated to start the evening at The Westcoast station. 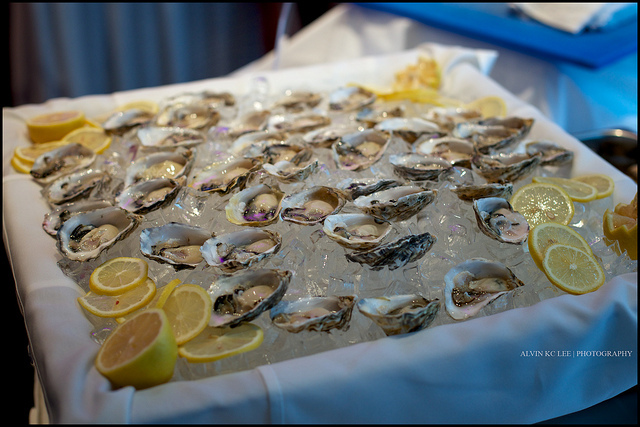 At the far left of the table was a massive ice box with Fresh Oysters sitting in half shells. Accompanying the oysters were a variety of condiments and sauces as well as fresh lemon pieces. As expected, the oysters were phenomenally fresh and delicious. I am not sure how many we were supposed to take (as the station was self-serve) but I ended up “sampling” about five or six. 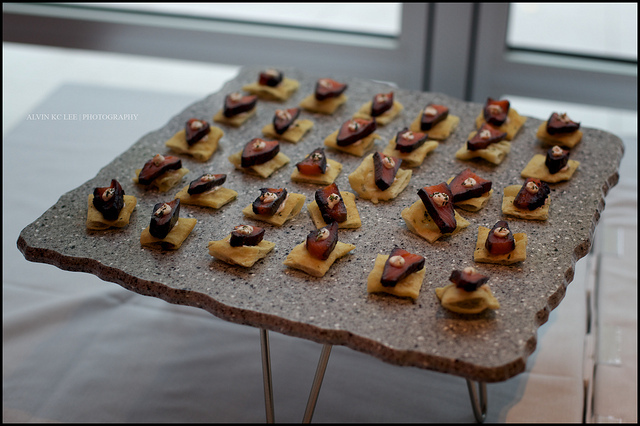 Moving on from the oysters, the next sample plate was made up of House Cured Blueberry Salmon on Rosemary Bannock. Although the pieces were small, the salmon was wonderfully flavourful with a subtle smokiness. The bannock was light and fragrant with hints of rosemary which complimented the salmon well. 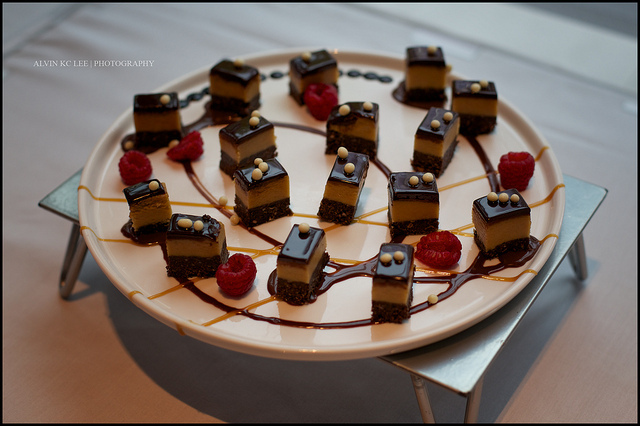 The dessert plate for this station was sample size pieces of Nanaimo Bar with Hazelnut Ganache. A fairly standard dessert for most, the Nanaimo bar itself was not overly sweet while the ganache provided that nice textural crunch to each sweet bite. Hopping on a quick flight or long car ride, I made my way to the second station which was represented by The Prairies. 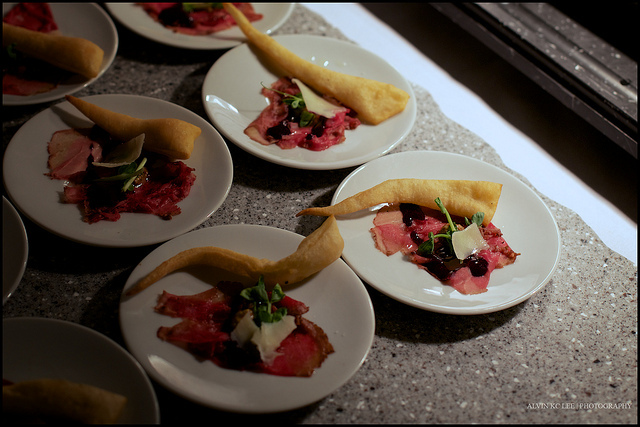 First up to try was the Peace River Bison Carpaccio with Crisp Bannock. The bannock was long and slightly chewy while the carpaccio was sliced extremely thin and melted in my mouth. A simple yet effective representation of one of Alberta’s finest meat exports. 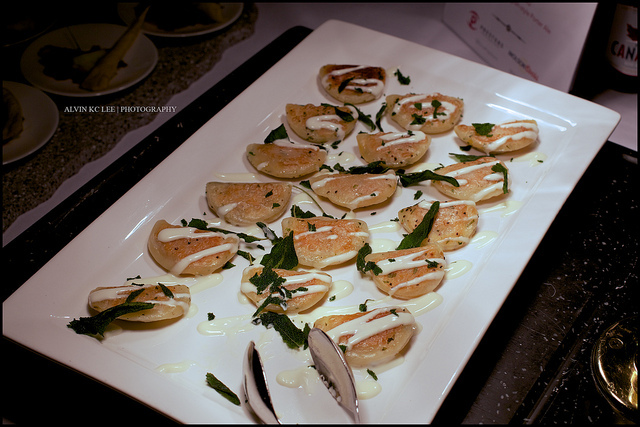 The second dish at this station was a plate of Pierogies with Crème Fraîche. Served warm and lightly drizzled in dressing, these were without a doubt one of the more addicting samples of the evening. From the beautiful, vast prairies I made my way to La Belle Province or Quebec for those that have forgotten their high school French. When one talks about foods that are uniquely Canadian, there is no denying that poutine is the first dish that comes to mind. 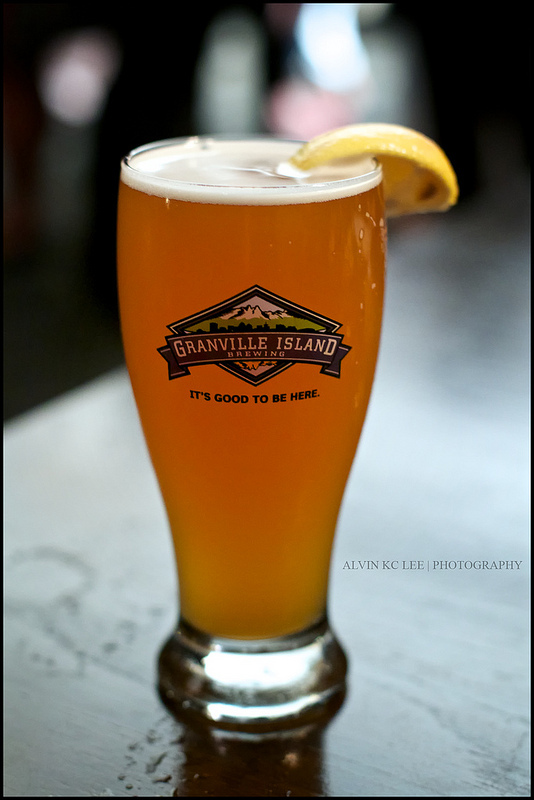 The Poutine with Granville Island Maple Cream Gravy had that extra touch of local pride that made this classic staple a true hit with everybody in attendance. The fries were served crisp and managed to keep from becoming mushy despite the generous gravy. Rounding out the Quebec table were plates of House-made Butter Tarts and Montreal Smoked Meat on Bagel Chips with Dijon Aioli. 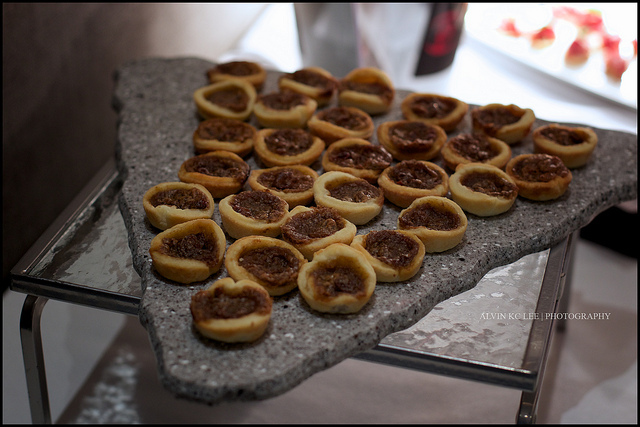 The tarts were light and not too sweet which made them a nice dessert element to pair with the heavier poutine and meat starters. The fourth and final culinary territory were The Maritimes. For those that love seafood, this table definitely did not disappoint. 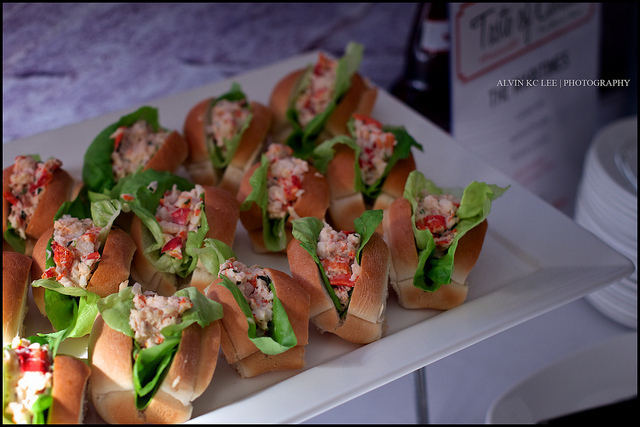 First up were the Lobster Rolls which were stuffed almost to overabundance with fresh lobster meat. The soft, fresh bread and crisp lettuce made for a substantial sandwich filled with ocean’s bounty. Balancing out the hefty sandwich was a thick and rich Seafood Chowder. 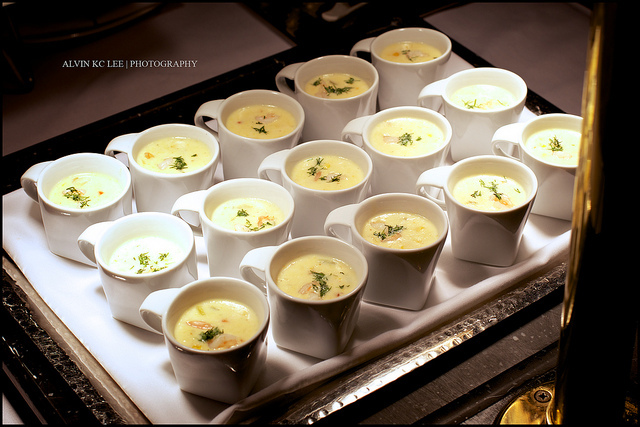 The actual chowder base was warm and creamy while the selective pieces of seafood made each shot quite filling. I can see a small bowl of this along with a lobster roll or two being perfect on a cold, rainy Vancouver day. After two hours of merriment, I had to leave but I know many of my colleagues stayed at the venue for 3-4 hours to socialize and enjoy the great beer. 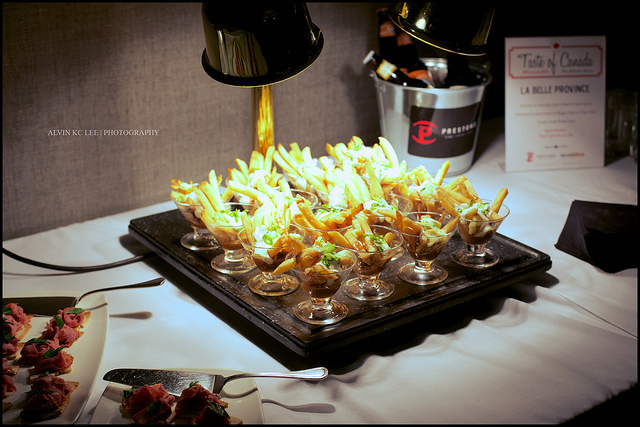 Overall, the event itself was very well executed and really showcased the new menu to the assembled media. The free beer was great but I most enjoyed how the dishes were so well tuned to the ambient experience you get at Prestons. I can definitely see myself swinging by in the months to come for a beer and some poutine or a hot bowl of chowder once the weather grows colder.